The Personal Capital ( ) Web app is a great tool for tracking your financial assets no matter what kind of computer you’re using. But you can’t use the Personal Capital website with any of your iOS devices.You’ll need to download the free Personal Capital iOS app, which, unsurprisingly is also a great way for you to track and manage your personal financial info while you’re on the go. Personal Capital is a universal app, so you can use it on your iPhone or iPad, but each app has a distinct look and offers differing sets of features depending on which version you use. The apps work great with a preexisting Personal Capital account, but you’re not required to have an existing account on the website to set the app up. Creating an account on your iOS device automatically creates a Web account as well. 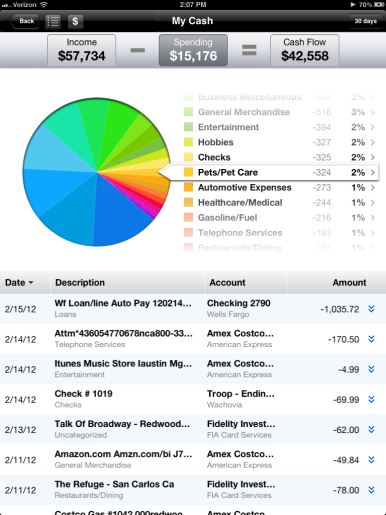 Up Close and Personal: Personal Capital (iPad version pictured) helps you keep tabs on your financial status no matter what device you're using. Setting the app up will differ depending on whether you already have a Personal Capital account or not. If you’re using an existing account you will need to enter your user ID and password. You will then be emailed a verification PIN, which you’re required to enter in order to add the iOS device to your account. If you’re creating a new account you will be required to provide a phone number that will be called anytime you add a new device to your account. In both cases you will also be required to setup a six digit PIN that you need to use each time you open the app on any of your iOS devices. When you log in using the iPad app, it opens to a dashboard that is quite similar to the dashboard on the web app. A bar graph at the top of the screen displays information about your current net worth. Just below this is a pie chart displaying your current spending which, when you swipe it to the left, displays a pie chart showing your current income information. Just below this is a graph of the current status of your investments. Tapping any of these graphs takes you to a more detailed view of your account activity and offers you the option of editing and updating the information for any of your transactions. 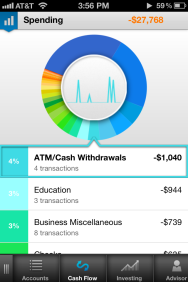 On an iPhone: Personal Capital is a Universal app. Both the iPad and iPhone iterations of the iOS app offer a feature that isn’t presently available on the Personal Capital Website and another that takes advantage of FaceTime. The first, called Universal Checkbook, lets you take a picture of a check from an account you track using Personal Capital, and, after verifying that the account is yours, lets you use your iOS device to transfer money between accounts or send payments to anyone anywhere. The second feature allows you to make an instant connection with your financial advisor using FaceTime on your device. This feature is only available during normal business hours (Monday to Friday, 6 a.m to 6 p.m PST), but it works very well. I was able to talk to my advisor with out a problem each time I connected. While these iOS apps are great, they’re not a complete solution. You will want to use them in conjunction with the web app. For example, if you try to setup a new bank account and there is some kind of problem finalizing the connection to that account you will be directed to the web app for resolving those issues. As I said in my review of the web version of Personal Capital, this is now my go-to tool for tracking all my financial information. Well designed and well integrated with the web version of Personal Capital, these iOS apps extend the capabilities and strength of what is already an excellent financial management tool.